An exciting Sci-Fi adventure delivered in a classic Hero's Journey meets wicked new Alien World! Josh Viola has crafted a gritty genre-mash of science fiction and fantasy, powered by iconic characters, imaginative action, and fate-of-the-world stakes. This is widescreen fiction, people: It's in your face, larger than life, and refuses to be ignored. Josh Viola’s debut novel is a science-fantasy epic, overflowing with violence and dark magic, romance and heartbreak, slavery and rebellion, cruelty and redemption. Above all it is the story of the transformation of little Yoto into an enormous creature whose new powers attract the wrath and vengeance of beings who possess the powers of the gods. Go Yoto! The Bane of Yoto combines hero elements of The Incredible Hulk™ with the alien landscape of Avatar, resulting in a rich storytelling environment that offers unlimited possibilities for video games. 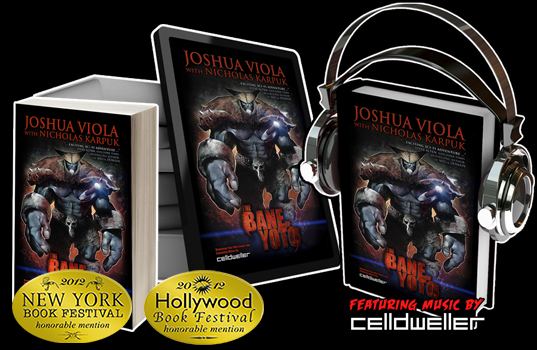 Joshua Viola has launched a mammoth dark-fantasy epic overflowing with monsters, brutal battles and oceans of blood.